The meeting took place on Saturday the 28th of April at the Lebanese Order of Physicians. The topics were presented by national and international experts. Discussed topics included the global epidemiology and burden of colorectal cancer, molecular pathways and the serrated polyp, strengths and weaknesses of opportunistic and program-based CRC screening, challenges and opportunities of FIT screening followed by a FIT workshop. 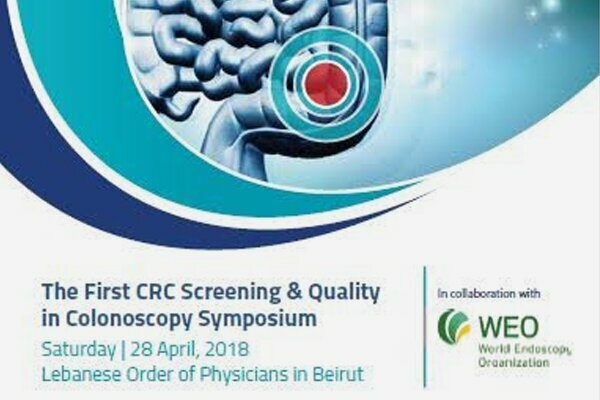 The rest of the topics that were presented included the WEO and LSGE commitment to quality, setting up a national quality program, quality metrics in colonoscopy, the optimal bowel preparation, polypectomy competencies, the difficult polyp and finally polyp differentiation using virtual chromoendoscopy vs white light endoscopy.